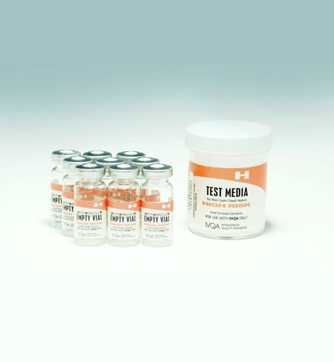 IVQA High-Complexity Media Fill Test Kit will provide you the tools to comply with the Media Fill Test Procedure standards in USP <797> on aseptic manipulation skills, including representative sterile microbial culture transfer and fill challenges. Our test kits are designed to document correct personal technique and effective environmental control for the preparation of low complexity compounded sterile products (CSP’s). All employees compounding high complexity preparations must have successfully passed the high complexity media fill test procedure at least every 6 months. The semi-annual completion of this test along with the quarterly re-validation tests, will satisfy the requirements for staff members who are involved in high complexity CSP. Administration should maintain documentation of employees successfully passing the high complexity media test procedure and the timely semi-annual documented reassessment. Revised USP <797> regulations mandate that training programs include a hands-on demonstration and practice with actual items such as CSP containers, devices and equipment. Regulations also require the caregiver practice aseptic and injection technique under the direct observation of a health professional. The caregiver is expected to demonstrate mastery of assigned activities before being allowed to administer CSP’s unsupervised by a health professional. IVQA media for High Complexity Media Test Kits contains dry nonsterile protein which when reconstituted creates nonsterile Tryptic Soy Broth. Once reconstituted, the test must be completed without interruption or bacteria will grow rapidly. Tryptic Soy Broth helps detect evidence of a wide variety of microorganisms, especially common aerobic and facultative anaerobic bacteria. Successful completion of this test will result in sterile Tryptic Soy Broth with no evidence of growth. Outside an ISO class 5 air quality environment, dissolve 3 gm of nonsterile commercially available Soybean-Casein Digest Medium in 100 ml of non-bacteriostatic water to make a 3% solution. 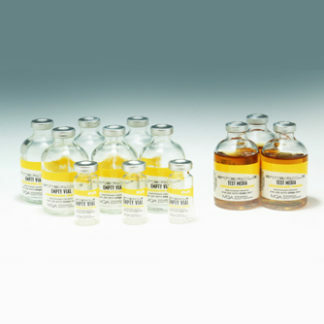 Withdraw 25 ml of the medium into each of three 30-ml sterile syringes. Transfer 5 ml from each syringe into separate sterile 10-ml vials. Label these vials as controls. These vials will generate exponential microbial growth, indicated by visible turbidity upon incubation. Under aseptic conditions (in an ISO class 5 air quality environment), and using aseptic techniques, affix a sterile 0.2-μm porosity filter unit and a 20-gauge needle to each syringe. Inject 10 ml from each syringe into each of two, 10 ml sterile vials. Repeat the process with each of the three syringes, injecting 10 ml aliquots into each of two, 10 ml sterile vials. On all 6 vials, write the name and date of person taking this test. Affix sterile adhesive seals to the closure of the nine vials, and incubated them at 25° to 35°C. Inspect for microbial growth over 14 days. 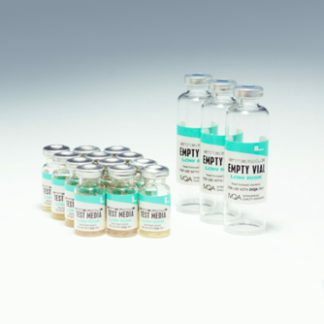 Sterile vials will remain clear and without bubbles, precipitate, cloudiness or changes in turbidity. Cloudiness, turbidity, bubbles or a precipitate on the bottom of any of the vials indicates bacterial contamination. All 6 vials must be sterile to constitute a passed test. The 3 control vials should become turbid or develop a precipitate demonstrating bacterial growth. To understand when a High-Complexity Media Test Kit is appropriate, below is a USP description of High Complexity CSPs.